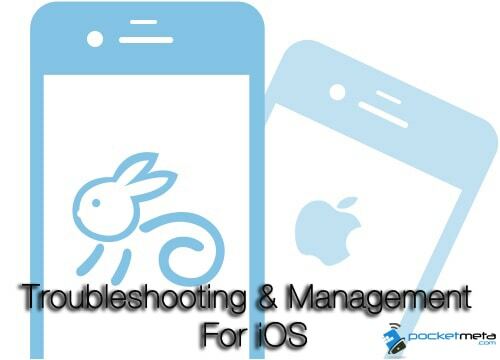 Tips & Tricks to using the versatile and robust iOS managing tools, iTools. For those of you who are not aware of what iTools is, it’s a file management tool used for iOS. It has versions for both Windows and Mac OS X and is compatible with iPhone, iPod Touch, and iPad, as long as it runs iOS 4.0 or higher it will work with iTools. Even though it is labeled as a file management tool, it’s really much more than that. 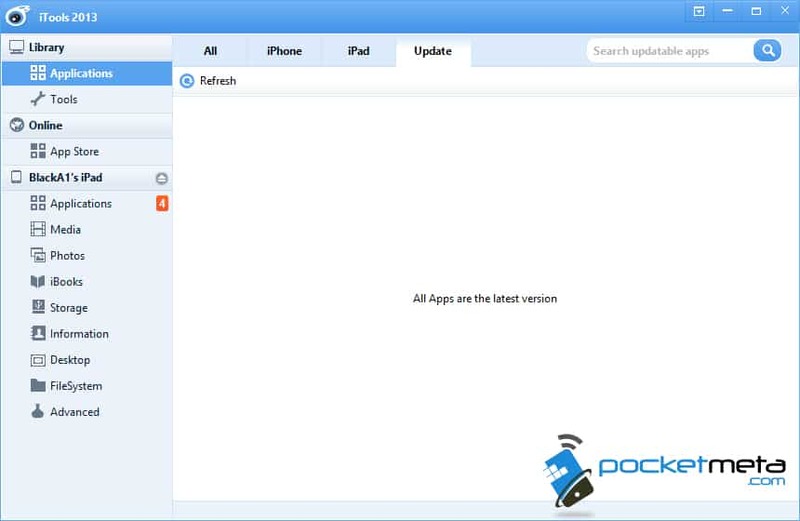 iTools offers several features and tools that can help troubleshoot a multitude of issues with iOS devices. This guide will go over each of the highlighted features in iTools to help you understand the vast functionality of this little iOS toolbox. If you’ve been using an application like iFunBox for file management, get ready to toss that one out, because iTools offers everything iFunBox does, with a much simpler interface, and much more functionality. First though, we’re going to just go over some basic information about the application. 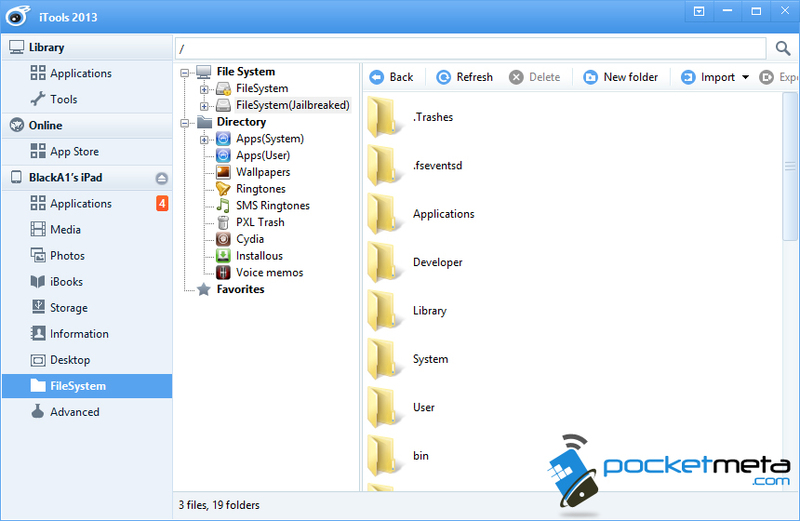 iTools is a very small standalone application that is just right around 3MB for both PC and Mac, standalone meaning that if doesn’t require a installation in order to run the program. Because its a standalone application without system dependencies you can place iTools on a USB thumb drive and bring it with you where ever you go. iTools is developed by Chinese company called ThinkSky and offers versions in English, Russian, French, and of course Chinese. About 98% of the application is translated, but don’t be too surprised if you see some Chinese text on some of the logos. At the time of this article, the English version is iTools 2013 Beta 0524, but there is a 2.0 version released in Chinese. 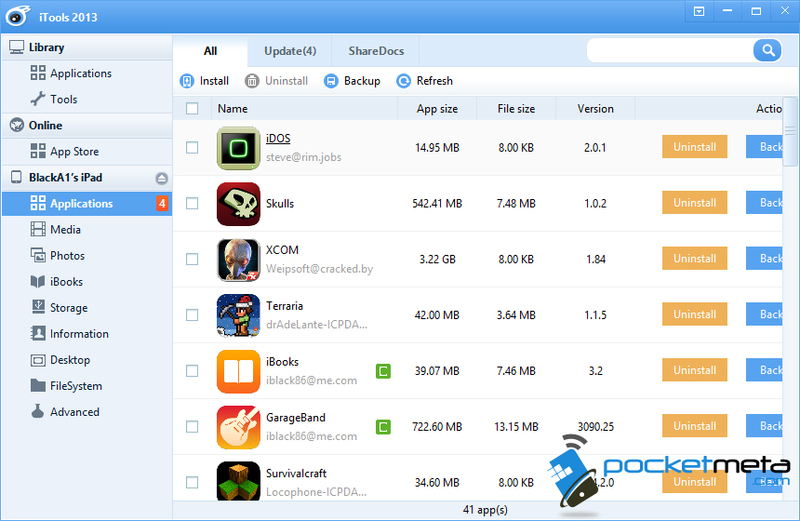 iTools does download with an installer and there may be older versions that include packaged applications, so make sure you read through the installer to make sure you’re not getting any additional junk. The download listed at the bottom of this page is the official release and has no packaged software. The most common use for iTools is used for File and App Management. If your device is jailbroken you’ll have a lot more options and uses with iTools, if it is not jailbroken you will still be able to access part of the file system and perform basic app management. We’ll be sure to point out features for jailbroken devices, anything that isn’t pointed out to be a jailbreak feature, isn’t and can be used on any device. If you’re interested in jailbreaking your device, you can check out our latest guide on jailbreaking iOS 7 here. 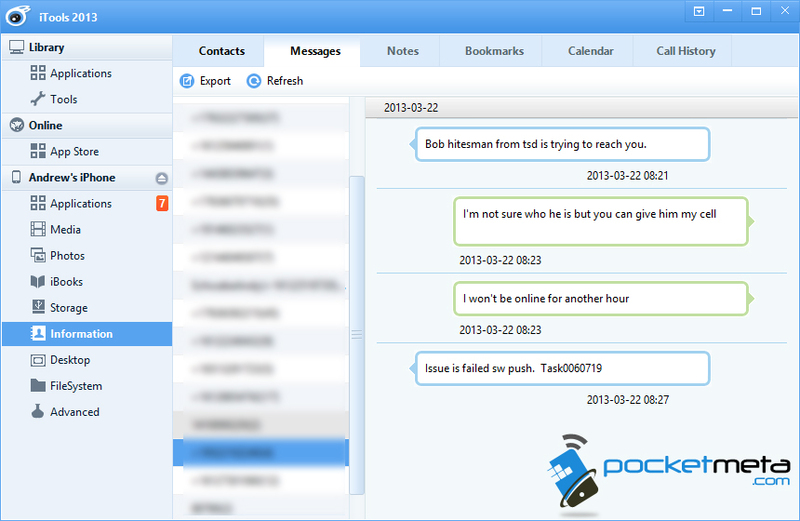 iTools offers the same kind of management that you would get uses iTunes, but with much much more functionality. The first tab on the left side labeled Applications will list all of the apps you have purchased or downloaded through the App Store from iTunes, for both iPad and iPhone, even if they’re not currently installed on the device. 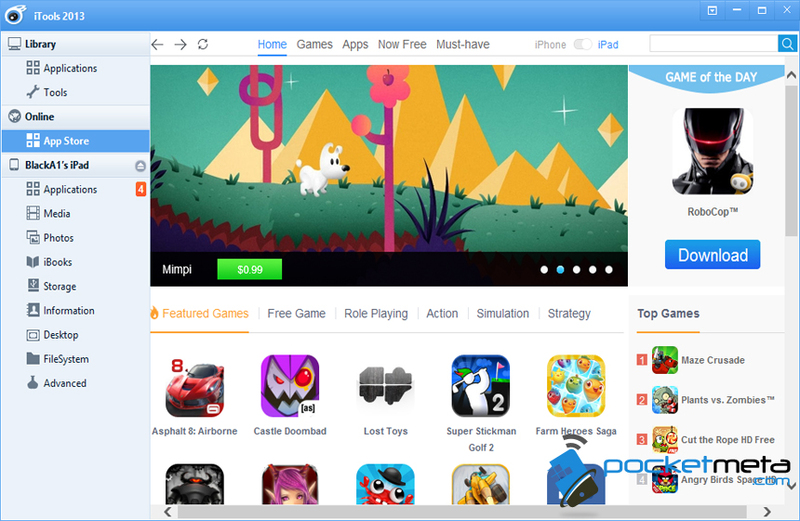 You’ll find tabs at the top to navigate to iPhone apps, iPad apps, and a tab that allows you to update apps as well. This only displays applications that were downloaded through iTunes or iTools, basically any apps that were downloaded with your computer. Under the App Store option you’ll get exactly what you would expect, the App Store. You can purchase and download apps from this menu just as you would from your device or iTunes. The Applications tab will show you all of the currently installed apps, and shared documents like iCloud game saves and documents. You can also update your apps from this menu using the update tab at the top. You can uninstall and create backups of each app, which can very helpful in creating single backups since iCloud is a all or nothing backup tool. If your device is jailbroken you can also install IPA or PXL files to your device. Most apps will not install without AppSync installed on your device, this can be a good tool if you’re a developer and want to test your app on your device, or if you want to install a app you have stored on your computer that is no longer listed in the App Store. The Media tab will allow you to manage all of your videos, music, podcasts, ringtones, voice memos, and playlists. You can import, export, and delete files, as well as create your playlists. I find this menu to work much faster and simpler than the one used in iTunes. The Photo tab will allow you to manage any pictures or albums saved on the device. You’re able to import, export, and delete images, as well as display them in a slideshow. The Books tab also provides the same functionality, listing all of your books stored on the device, as well as allowing you to import, export, and delete books. The Storage tab allows you to store files on the device to be later accessed by any computer. It works the same way a external drive would, so you can use your device as a USB thumb drive. Under the Information tab you’ll find all of your contacts, messages, notes, bookmarks, calendar entries, and call history. This is a great tool to quickly access any of this information from iTools, whether you’re trying to find a text someone sent you months ago or need want to export some notes to your computer. All of the categories under the Information tab allow you to export the information to a CSV file. This is an excellent way to keep backups of messages or call logs without having them use up space on your device or iCloud service. This next portion will cover the functions that can be very helpful in troubleshooting issues with your device. 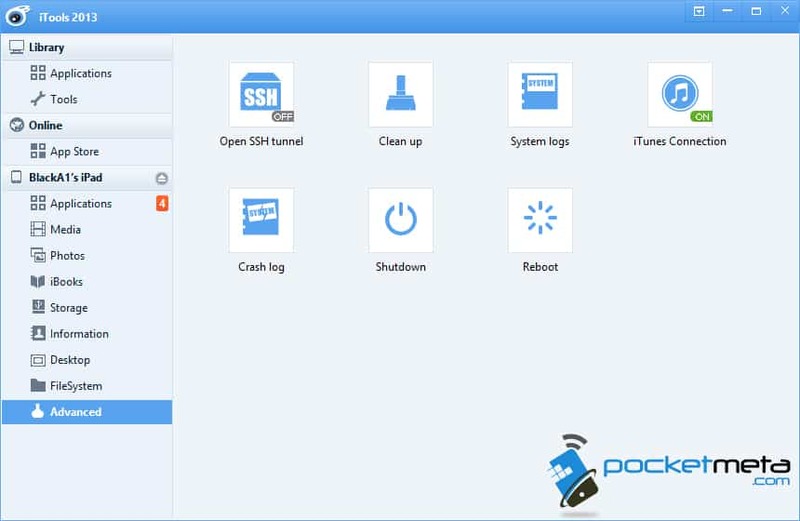 For instances, if your device has a cracked screen making it impossible to use the device, you’ll be able to connect the device to iTools and get access to the file system, desktop, crash logs, and more. The device will need to be powered on, so as long as you can get the device to boot up, these are excellent tools for troubleshooting issues with the device. 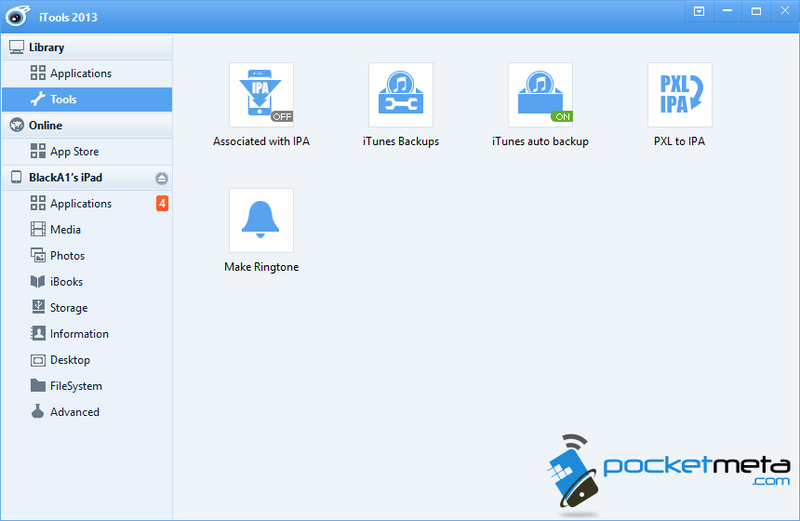 The tools menu offers a few basic options, you can create iTunes backups or turn on auto backup for iTunes, convert PXL files to IPA, associate IPA files with iTools, and even create ringtones. The ringtone creator is probably my favorite tool on this list, you can take any WAV or MP3 file and create it into a Ringtone by cutting out a portion of the track. Most of the real useful tools however, are located under the Advanced tab. Here’s where the real meat in troubleshoot lies. I can’t begin to count how many times using these features has helped me recover a corrupted app, save, or even file. Cleanup option will remove all the unneeded junk from your system like temporary files, cache, system thumbnails, as well as some other stuff. It’s a good tool to use if you’re having any weird issues with any apps. System log will show a real-time log of everything happening on your device, so if a app is crashing or experiences problems, try pulling this tool up to get more information on what is happening. Note: As these are listed, these are advanced tools, if you’re unsure of how something works on the system it’s best to do some research and know what you’re working with before attempting to make changes on your system based on the information given in these logs. Crash Log will open a folder with individual crash logs. Each of the logs are listed in PLIST format, which if you’re using a Windows OS you’ll need a PLIST editor or reader installed on your machine to view them. I would recommend PLIST Editor which can be downloaded for free on its official site here, a PLIST editor is included with OS X. This is by far the tool that I use the most, there have been times that I’ve worked with developers to try and recover a corrupted save or figure out why a app isn’t running on my device. Even if you don’t know what these crash reports mean, they can be invaluable to the developers. It will also hold system crash logs as well as apps, so if you’re dealing with a complete system crash it’s a great tool to use to find out what is causes your device to crash. If only people used this tool instead of posting 1 star reviews on the App Store that say “App crashes right away!” we would have way less apps that crash on the App Store. iTunes Connection should be turned on to enable many of the functions of iTools, but if for any reason you don’t want iTools connecting to iTunes, this is where you can turn that off. Reboot will restart your device, useful because iOS still for some unknown reason does not offer a restart option. The Desktop feature is actually how I discovered iTools, I was looking for a program that could give a live stream from the device to my computer to record on-screen activity. iTools does have a Live Desktop option which displays whatever is on your screen into the application, it even allows you to take screen shots and record video. Unfortunately, it’s very slow and doesn’t work well to capture footage of games or even most apps. The Icon option however is extremely useful, you can manage your devices desktop by clicking and dragging icons to wherever you want. This makes organizing your desktop much faster, than trying to organize apps from the device itself. This is also a really useful tool to take screen shots of your desktop in case you’re planning to do a factory wipe, or if your screen is busted and you want a way to access your desktop. 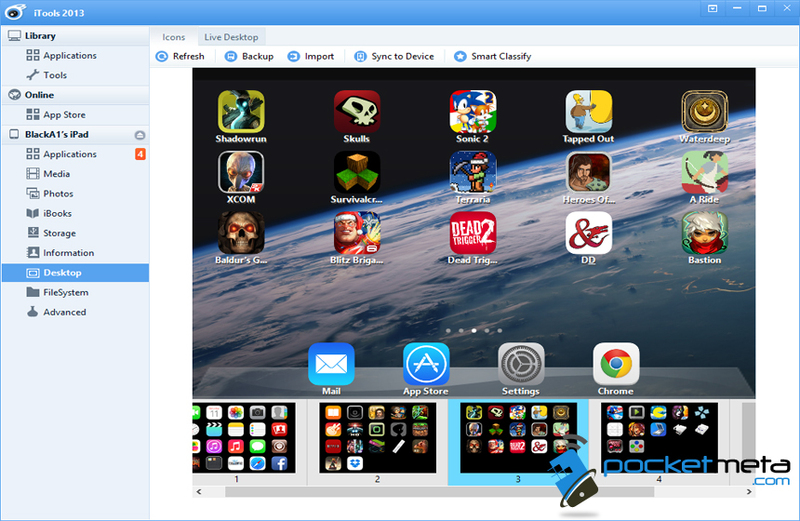 So that’s a basic overview of all the functions and features within iTools, a very powerful tool that can help you manage every aspect of your iOS device, as well as troubleshooting games, apps, system issues, and also allowing you to create manual backups outside of iTunes or iCloud. Whatever type of troubleshooting or management you need done on your device, chances are that iTools has what you need. iTools is currently completely free, and a excellent alternative to using iFunBox or iTunes, it doesn’t have any annoying ads and provides a simple, yet robust approach to managing your device. If you have any questions or comments regarding iTools, be sure to leave them in the comment section below. You can also like our Facebook page, follow us on Twitter, and add us to your circles in Google+ to keep yourself up to date on all things mobile.